CRUISING into Liverpool on the Leeds & Liverpool Canal has always been a bit of a challenge, but it is now going to be worse. From next Monday, Canal & River Trust, cutting out even more of its workers, is making what it calls 'Getting to Liverpool your way' meaning it has introduced all-boater operation to its road barriers and swing bridges, installing landing stages for the purpose, Keith Gudgin tells us. One road bridge that will be of concern is Handcock’s Swing Bridge (9). It carries a very important road with restrictions in force at busy periods and boaters will be responsible for thus holding up a great deal of traffic. 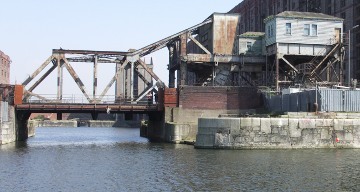 The swing bridges and locks into Stanley Dock will also have to be boater operated. There is a new landing stage at both Handcock's and Netherton swing bridges, with no assistance any longer available. For a short while it is expected that a 'roving lock keeper' will be available at the docks who will be available for guidance. Not needing any staff means however that there will be unlimited boat movements during allocated windows (8:00am to 9:30am travelling out of Liverpool and 1pm to 4pm travelling into Liverpool daily except Tuesdays.